Every website project presents different design challenges for designers, developers, and SEO professionals. At Websites Orlando .Com, we streamline our process to deliver the best top quality websites to our business clients. Our approach is simple: "Design and implement a professional business presence for the internet, with exceptional search engine optimization". Your new website will feature Solid Page Code, Stunning Layouts and Graphics, Dynamic Scripting, Feature Rich Page Content, Intuitive Navigation, and Strong Search Engine Optimization. We offer complete Website Design Solutions from concept to publishing, with no hidden fees or add ons to slow your progress. We have all of the tools to design your professional web presence. Your new website will be awesome! Communication and Customer Service are the cornerstone of our business at Websites Orlando .Com. As with every project, we are personable, professional and available to assist you every step of the way. Like a great song, great websites that are properly tuned for the search engines climb to the top of the charts. Search Engine Optimization ( SEO ) is the process of targeting specific keywords within your site structure to achieve high search engine rankings. These "Keywords" are a broad collection of words and phrases specific to your industry, service, products, business location, competition, and target market goals. Our SEO Research and Discovery Process will build on your industry keywords to find out exactly what people are searching for in your business arena. In addition to the SEO Keywords Process, there are many additional methods to apply Search Engine Optimization to your Website. The best SEO Strategies are implemented in the early stages of website design. We build ALL of our websites Search Engine Ready. Our SEO Consulting Services are always thorough and professional. Our Power Up 3D approach to Web design transforms your site from a flat, one dimensional website into a Dynamic 3D Presentation. Command your client's and web visitor's attention with Captivating Multimedia Web Content. Websites Orlando .Com specializes in Streaming Audio, Streaming Video, Virtual Tours, Custom Music Production, and Flash Animation. Let us produce your Corporate Branding Project with HD Video, HD Audio, Custom Music, Voice Over, and Flash from conception to final product. Stream your multimedia content from the web, or take advantage of our CD/DVD Duplication Services with Full Color On-Disk Printing. We work with the best Multimedia Companies in Orlando and Central Florida to produce the best Multimedia presentations for your business. Our in-house music company, www.musicproducer.net, is one of the best Music Production Companies in Central Florida. Featuring Saxophone and prolific Jazz and Corporate Music Composition from Music Producer James Joseph. Web Hosting is a basic area or "Directory" created on a Web Server that stores and broadcasts your website files to the internet. Simple right? Not all Web Servers are created equal. Just like Website Design, Web Hosting can encompass many complex issues that effect your website functionality and website presentation. Web Hosting addresses issues of Web Server Speed, Web Server Security, Email, FormMail, Spam, Uptime, and Backend Server Applications to expand your website with Ecommerce, Blogs, Database Statistics and more. We offer both Shared Hosting and Dedicated Hosting options for your business website. Our Orlando Web Hosting Solution is a rock solid addition to your new website. Featuring VPS (Virtual Private Servers) to meet and exceed your Web Hosting needs in Orlando and Central Florida. Our VPS Web Servers are pre-configured for Speed, Security, Email, and Web Applications to optimize the business functionality of your website. Welcome to Websites Orlando .com located in Orlando, Fl. Websites Orlando provides professional web hosting services and search engine optimization for your company website. 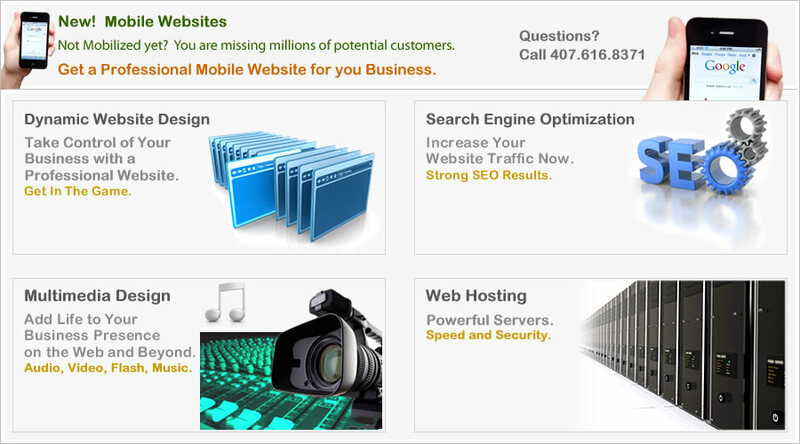 Our web hosting includes SEO solutions for small or large business clients, and companies serving the Orlando FL area. Hosting options include shared web hosting or dedicated web hosting from the best VPS servers. Need professional web hosting to showcase your new business website? Websitesorlando .com specializes in professional hosting solutions, development, website marketing developers, encoding and search engine optimization. Websites Orlando has provided comprehensive website hosting and development services for companies in Orlando Florida since 1995. We believe our design packages including hosting, SEO, web development, web design, and web marketing provide some of the best web resources in the Orlando and Central Florida area. If you need a professional company and professional designer services for your business, Websites Orlando .com is the designer and developer for you. Contact us today at websitesorlando .com for your internet web hosting (shared or dedicated) services.